Asia's 50 best restaurants in 2019 - CNN travel. List of restaurants in China - Wikipedia. CUI YUAN - head chef: Sun Xiaochun. 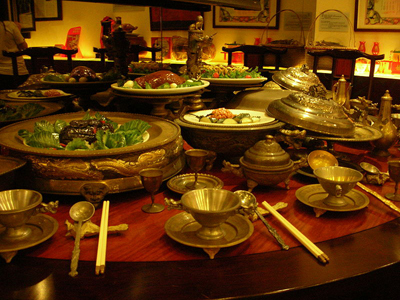 Serves Manhan Quanxi, or the Manchu and Han Imperial Feast, consisting of 268 dishes, not including appetizers and deserts. Price: US$54,000. DA DONG ROAST DUCK - selling itself on the claim that its birds (RMB 198 per whole duck) are leaner than those of other roast duck restaurants. RESTAURANT QUANJUDE - founded 1864. The well-known All-Duck Banquet is headed by QUANJUDE roast duck and supported by over 400 dishes with QUANJUDE characteristic flavor. Government leaders, officials and VIPs from nearly 200 countries and regions have visited QUANJUDE roast duck restaurants and had dinner here. 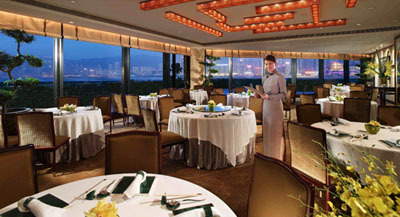 WEST LAKE RESTAURANT - the biggest restaurant in the world. 5,000 seats. 13,200 sq. m. Hunan cuisine, Cantonese cuisine. The restaurant complex is located 20 minutes from Changsha Huanghua International Airport, and covers an area of about 5.8 hectares. 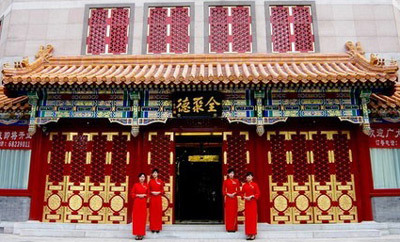 The numerous buildings were constructed in the traditional Chinese architectural style. The entire complex covers four different areas. Area A includes 70 large and small rooms, together with a performance hall, where daily shows take place. 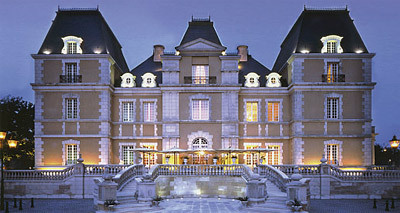 Area B comprises ten luxury private rooms in the style of Imperial Palaces. Area C has nine private luxury rooms, and area D is a "Snack Food Street". 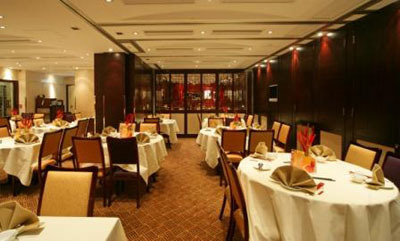 The restaurant mainly offers traditional Chinese dishes of Hunan cuisine and Cantonese cuisine. 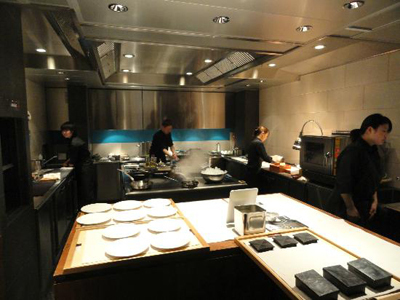 The restaurant employs a thousand people, including 300 chefs in five kitchens. Each week, approximately 700 chickens and 2,600 pounds of pork are used. Yu’s Family Kitchen NW (Chef: Yu Bo). Specialty: tea-smoked duck. Family Li Imperial Cuisine R&C (Chef: Ivan Li). LARIS RESTAURANT (Chef: Davis Laris). 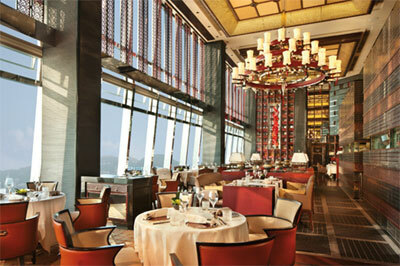 Highly acclaimed Three on the Bund. 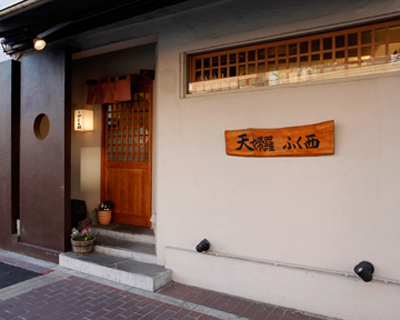 Voted the city's 'Restaurant of the Year' three times in a row since opening in 2004. M1NT - perched on the top floor of M1NT Tower with imposing views of The Bund and Shanghai's dramatic skyline. "Seating 160 guests and set with an open theatre kitchen, funky music and stunning decor we strive to uphold our title of the best dining experience in China". Mr & Mrs Bund sp (Chef: Paul Pairet). Ultraviolet by Paul Pairet - Waitan, Huangpu, Shanghai, China, 200000. "Ultraviolet is the first restaurant of its kind uniting food with multi-sensorial technology in order to create a fully immersive dining experience." At the restaurant Ultraviolet in Shanghai, Chef Paul Pairet has taken the dining and turned it into theater, adding ambient music, enhancing scent and unorthodox utensils to the menu. 8½ OTTO E MEZZO - BOMBANA *** (Chef: Umberto Bombana). Italian cuisine. AMBER ** SP (Chef: Richard Ekkebus). French contemporary cuisine. At The Landmark Mandarin Oriental. BA YI - Xinjiang cuisine. BO INNOVATION ** sp NW (Chef: Alvin Leung Jr.). Specialty: pork mui choi. BOMBAY DREAMS Bib. Indian cuisine. BRASS' (Chef: Mickael Le Calvez). French cuisine. CAFÉ GRAY (Chef: Gray Kunz). European contemporary cuisine. CAFÉ HUÉ Bib. Vietnamese cuisine. CAPRICE *** sp (Chef: Vincent Thierry). French cuisine. At the Four Seasons Hotel. 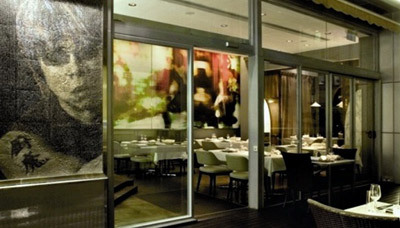 CASA LISBOA - Portuguese cuisine. CELEBRITY CUISINE ** NW (Chief chef: Cheng). Cantonese cuisine. Specialty: shark fin. At Lan Kwai Fong hotel. 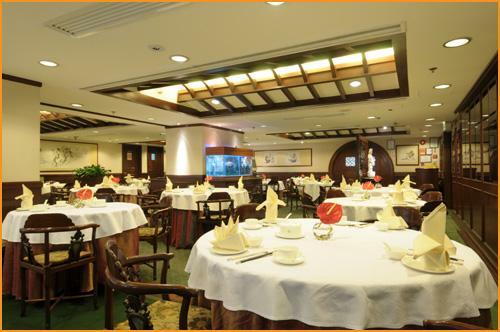 CELESTIAL COURT - Cantonese cuisine. CÉPAGE * sp (Executive chef: Sebastien Lepinoy). French contempory cuisine. chan kan kee chiu chow - Chiu Chow cuisine. CHEUNG KEE - Pekingese cuisine. CHILLI FAGARA *. Sichuan cuisine. CHUEN CHEUNG KUI Bib. Hakkanese cuisine. CITY HALL MAXIM'S PALACE - Cantonese cuisine. Crystal Jade La Mian Xiao Long Bao Bib. Chinese cuisine. At Wan Chai. Cuisine Cuisine * (Executive chef: Lee Yuk-lam). Cantonese cuisine. At the IFC Mall. DA PING HUO Bib. Sichuan cuisine. DIN TAI FUNG - Shanghainese cuisine. DOMANI (Chef: Pier Bussetti). Italian cuisine. DOT COD - seafood restaurant & oyster bar. Owned by the Hong Kong Cricket Club. 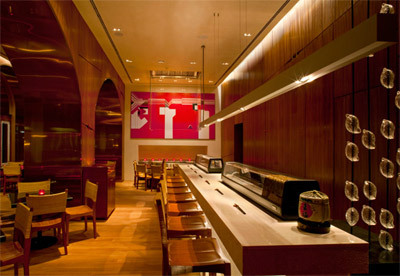 dragon-i - "Asia's most creative and eclectic vision of lounge, dining and partying for the global glitterati." DYNASTY * (Head chef: Mango Tsang). Cantonese cuisine. At Renaissance Harbour View Hotel. FAN TANG - Chinese cuisine. FARM HOUSE - Cantonese cuisine. FOFO BY EL WILLY (Chef: Alex Martinez Fargas): Spanish cuisine. FOOK LAM MOON * (Head chef: Law On). Cantonese cuisine. FORUM * (Head chef: Yeung Koon Yat). Cantonese cuisine. FU SING (Causeway Bay) Bib. Cantonese cuisine. FU SING (Wan Chai) Bib. Cantonese cuisine. GOLD BY HARLAN GOLDSTEIN - European contemporary cuisine. GOLDEN BAUHINIA Bib. Cantonese cuisine. At the Hong Kong Convention and Exhibition Centre. 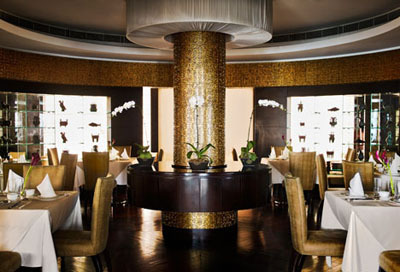 GOLDEN LEAF - Cantonese cuisine. At Conrad hotel. GOLDEN VALLEY *. Chinese cuisine. At The Emperor Hotel. Grand Cuisine Shanghai Kitchen - Shanghainese cuisine. 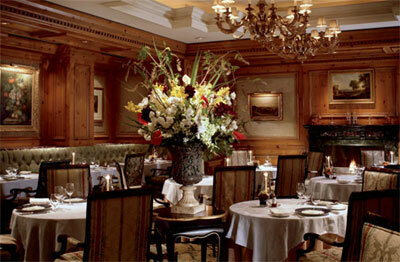 GRAND HYATT STEAKHOUSE - steakhouse. Head chef: David Campbell. At Grand Hyatt hotel. GRISSINI - Italian cuisine. At Grand Hyatt hotel. HAINAN SHAOYE - Singaporean & Malaysian cuisine. HAKKA YÉ YÉ (Central) - Hakkanese cuisine. HAKKA YÉ YÉ (Causeway Bay) - Hakkanese cuisine. HIDE-CHAN Bib. Japanese ramen cuisine. Located on the upper ground floor of The Loop. HIN HO CURRY (Sai Wan Ho) Bib. Indian cuisine. HIN HO CURRY (Shau-Kei-Wan) *. Indian cuisine. HO HUNG KEE *. Noodles & congee cuisine. HONG ZHOU * (Chef: Mr. Ng). Hang zhou cuisine. HUGO'S - European cuisine. At Hyatt Regency hotel. HUNAN GARDEN - Hunanese cuisine. HUNG'S DELICACIES *. Chiuchow cuisine. IR 1968 - Indonesian cuisine since 1968. ISLAND TANG *. Cantonese cuisine. JADE GARDEN Bib. Cantonese cuisine. JOI HING - Cantonese roast meats (char siu) cuisine. Founded in 1975. KEUNG KEE MEAT SHOP - Cantonese roast meats cuisine. KIN'S KITCHEN Bib. Cantonese cuisine. 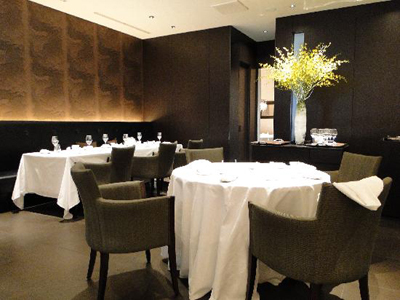 Krug Room - "Offering a taste of progressive gastronomy, there is no menu in The Krug Room. Instead, each evening’s dinner varies between 10-14 courses and is created according to Executive Chef Uwe Opocensky’s inspiration. Alongside these dishes, guests can select from the largest collection of Krug champagne outside of France." At Mandarin Oriental hotel. KWAN CHEUK HEEN - Chinese cuisine. At Harbour Grand North Point Hotel. L'Atelier de JOËL ROBUCHON *** sp WS (Executive Chef: Philippe Groult). French contemporary cuisine. At The Landmark Mandarin Oriental hotel. LA MARMITE Bib. French cuisine. LE 188° - European contemporary cuisine. On the 41st (top) floor of the Harbour Grand North Point Hotel. 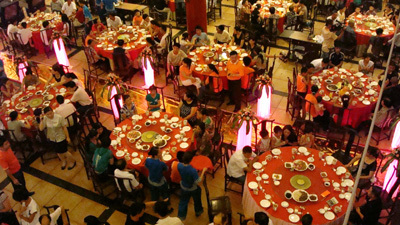 LEI BISTRO - Chinese cuisine. LEI GARDEN (Causeway Bay) *. Cantonese cuisine. LEI GARDEN (IFC) *. Cantonese cuisine. LEI GARDEN (North Point) *. Cantonese cuisine. LEI GARDEN (Wan Chai) *. Cantonese cuisine. LIL' SIAM - Thai cuisine. LIN HEUNG KUI Bib. Cantonese cuisine. LIN HEUNG TEA HOUSE - Cantonese cuisine. LINGUINI FINI - Italian cuisine. 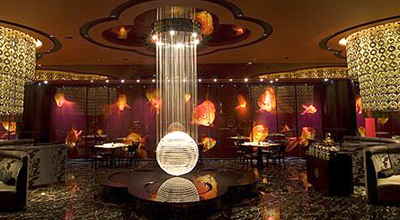 LIU YUAN PAVILION - Shanghainese cuisine. LOBSTER BAR AND GRILL - seafood (Head chef: Leung Wing Yeung). At Shangri-La hotel. LUK YU TEA HOUSE - serves Hong Kong's best Dim Sum. 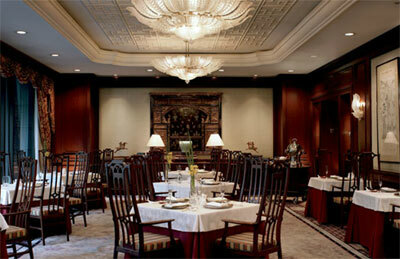 LUNG KING HEEN *** sp (Executive chef: Chan Yan Tak - the first Chinese chef to earn three Michelin stars). At the Four Seasons Hotel. MADAM SIXTY ATE - European contemporary cuisine. MAK AN KEE - noodles. MAK'S NOODLE - noodles. Since 1960. MAN WAH * (Chef: Man-Sing Lee). Cantonese cuisine. 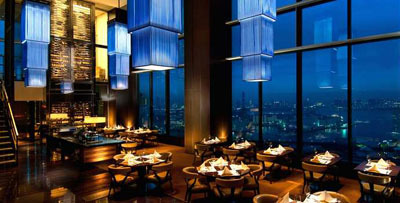 Located on the 25th floor of Mandarin Oriental hotel. 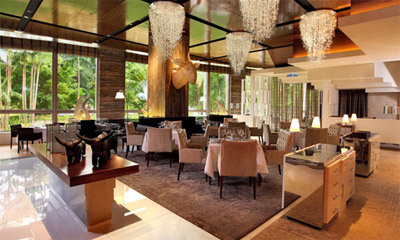 MANDARIN GRILL + BAR * (Executive chef: Uwe Opocensky). European contemporary cuisine. At Mandarin Oriental hotel. MEGAN'S KITCHEN Bib. Cantonese cuisine. MESA 15 Bib. Spanish cuisine. MIRROR * (Chef: Jeremy Biasiol). French contemporary cuisine. MIST *. Japanese ramen cuisine. 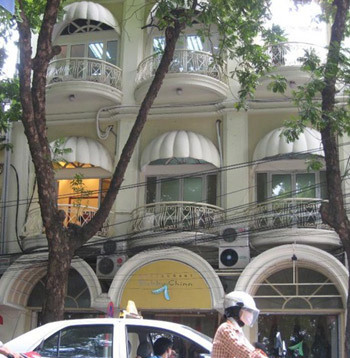 NHA TRANG Bib. Vietnamese cuisine. NICHOLINI'S - Italian contemporary cuisine. At Conrad hotel. ON LOT 10 - French cuisine. 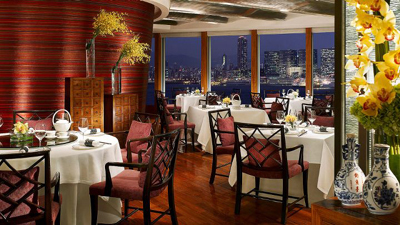 ONE HARBOUR ROAD - Cantonese cuisine. At Grand Hyatt hotel. PEKING GARDEN (Central) - Pekingese cuisine. At Alexandra House. 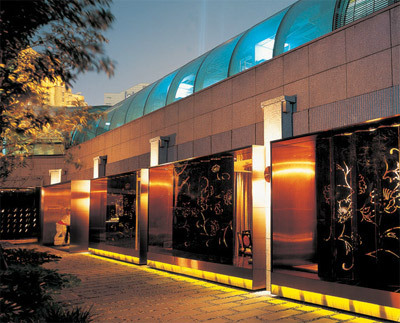 PEKING GARDEN (Tai Koo Shing) - Pekingese cuisine. PETRUS * (Chef: Frederic Chabbert). French cuisine. At Island Shangri-La hotel. PIERRE ** (Chef: Nicolas Boujéma). 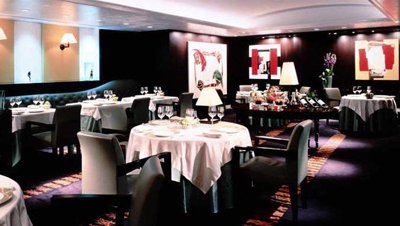 French chef Pierre Gagnaire's restaurant on the 25th floor of the Mandarin Oriental hotel. PRAWN NOODLE SHOP - noodles. 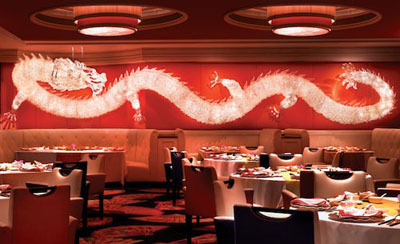 REGAL PALACE - Cantonese cuisine. At Regal Hotel. SANG KEE CONGEE SHOP - noodles & congee. SE WONG YEE Bib. Cantonese cuisine. SER WONG FUN Bib. Cantonese cuisine. 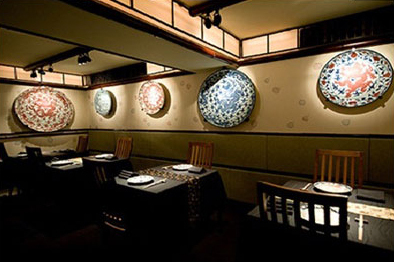 SHANGHAI GARDEN - Shanghainese cuisine. SHEK KEE KITCHEN Bib. Cantonese cuisine. SNOW GARDEN - Shanghainese cuisine. ST. BETTY - French cuisine. SUMMER PALACE *. Cantonese cuisine. At Island Shangri-La hotel. SUN KAU KEE NOODLE SHOP Bib. Noodles & congee. SUN YUEN HING KEE Bib. Cantonese roast meats. SUPERIOR RICE ROLL PRO SHOP Bib (Head chef: Wong Tim-fat). Dim sum cuisine. 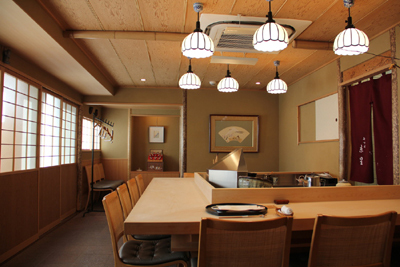 SUSHI FUKU-SUKE - traditional Japanese cuisine. SUSHI SASE - traditional Japanese cuisine. SUSHI TA-KE (Chef: Kimijima). Traditional Japanese cuisine. TASTY (Happy Valley) Bib. Noodles & congee. TASTY (IFC) Bib. Noodles & congee. THAI BASIL - Thai cuisine. THE CHAIRMAN * NW. Cantonese cuisine. Specialty: stir-fried pork neck. 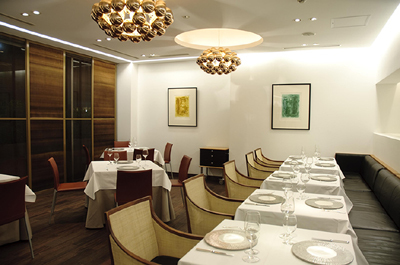 THE DRAWING ROOM - Italian contemporary cuisine. At JIA Boutique Hotel. THE PRESS ROOM - French cuisine. THE SQUARE *. Cantonese cuisine. 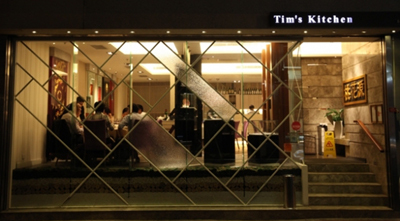 TIM'S KITCHEN * (Chef: Yau-Tim Lai). Cantonese cuisine. TRATTORIA DOPPIO ZERO (Chef: Jake Addeo). Italian cuisine. TRUSTY CONGEE KING - congee cuisine. TSIM CHAI KEE (Queen's Road) - noodles & congee. TSIM CHAI KEE (Wellington Street) - noodles & congee. TULSI Bib. (Chef: Ravi). Indian cuisine. UNO MÁS (Chef: David Izquierdo). Spanish cuisine. WAGYU KAISEKI DEN * (Chef: Hiroyuki Saotome). Traditional Japanese cuisine. WANG FU Bib. Chinese dumplings. XI YAN SWEETS Bib. Chinese cuisine. YAT TUNG HEEN *. Cantonese cuisine. At Great Eagle Centre. YÉ SHANGHAI - Shanghainese cuisine. YELLOW DOOR KITCHEN - Sichuan cuisine. YUÈ *. Cantonese cuisine. At City Garden Hotel. YUNG KEE - Cantonese cuisine. 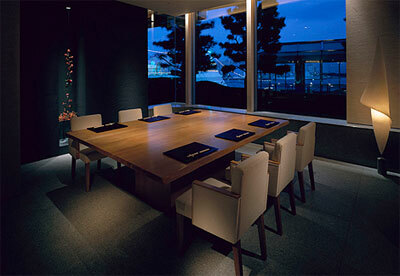 ZUMA - Japanese contemporary cuisine. At The Landmark shopping mall. ABOVE & BEYOND - Cantonese cuisine. At Hotel Icon. ah yat harbour view * (Chef: Yeung Koon Yat). Cantonese cuisine. AL MOLO (Chef: Michael White). Italian cuisine. ANGELINI Italian cuisine. At Mandarin Oriental hotel. BLT STEAK (Chef: Laurent Tourondel). Steakhouse. CHESA - Swiss cuisine. At The Peninsula hotel. Crystal Jade La Mian Xiao Long Bao Bib. Chinese cuisine. At Harbour City Mall. Crystal Jade La Mian Xiao Long Bao Bib. Chinese cuisine. At Chek Lap Kok International Airport. Cuisine Cuisine * (Executive chef: Ken Yu). Cantonese cuisine. At The Mira hotel. DimDim Sum DimSum Specialty Store NW. Specialty: siu mai dumplings. DIN TAI FUNG *. Shanghainese cuisine. DONG LAI SHUN Bib. Chinese cuisine. At The Royal Garden hotel. DRAGON KING (Chef: Wong Wing Chee). Cantonese cuisine. FELIX - European contemporary cuisine. Designed Philippe Starck. At The Peninsula. FU HO *. Cantonese cuisine. At the Miramar Shopping Centre. FUNG SHING - Cantonese cuisine. GADDI'S (Executive chef: Remi van Peteghem). French cuisine since 1953. At The Peninsula. GOOD HOPE NOODLES Bib. Noodles & congee cuisine. HARBOUR GRILL - International cuisine. At Harbour Grand Kowloon hotel. HOI KING HEEN *. Cantonese cuisine. At InterContinental Grand Stanford hotel. HOI YAT HEEN - Cantonese cuisine. At Harbour Grand Kowloon hotel. INAGIKU - traditional Japanese cuisine. At The Royal Garden hotel. IPPUDO Bib. Japanese ramen cuisine. KWAN KEE BAMBOO NOODLE Bib. Noodles. LAN YUEN CHEE KOON Bib. Cantonese cuisine. LAU SUM KEE Bib. Noodles & congee. LEI GARDEN (Elements) *. Cantonese cuisine. LEI GARDEN (Kowloon Bay) *. Cantonese cuisine. 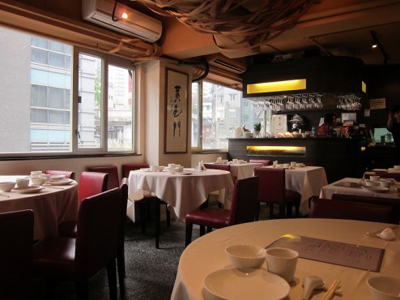 LEI GARDEN (Kwun Tong) - Cantonese cuisine. LEI GARDEN (Mong Kok) **. Cantonese cuisine. LEI GARDEN (Tsim Sha Tsui) *. Cantonese cuisine. LO CHIU (Jordan) - Vietnamese cuisine. LO CHIU (Tsim Sha Tsui) - Vietnamese cuisine. LOONG TOH YUEN (Chef: Sze Fai). Cantonese cuisine. At Hullett House. MALAYSIA (PORT KLANG) CUISINE - Malaysian cuisine. MASK OF SICHUEN & BEIJING Bib. Sichuan cuisine. MING COURT ** (Chef: Tsang Chiu King). Cantonese cuisine. At Langham Place hotel. NANHAI NO. 1 *. Chinese cuisine. NOBU (Chef: Nobu Matushisa). Japanese contemporary cuisine. At InterContinental hotel. ONE DIM SUM *. Dim sum cuisine. PEKING GARDEN - Pekingese cuisine. SHANG PALACE ** (Chef: Mok Kit Keung). Cantonese cuisine. At Kowloon Shangri-La hotel. SHANGHAI WING WAH - Chinese cuisine. SHANGHAI XIAO NAN GUO Bib. Shanghainese cuisine. SIU SHUN VILLAGE CUISINE - Shun tak cuisine. Spoon by Alain Ducasse ** (Chef: Philippe Duc). French cuisine. At InterContinental hotel. SPRING MOON - Cantonese cuisine. At The Peninsula hotel. ST. GEORGE *. French contemporary cuisine. At Hullett House. STEIK WORLD MEATS - steakhouse. SUN TUNG LOK **. Since 1969. Chinese cuisine. T'ANG COURT *. Cantonese cuisine. At The Langham hotel. TAK LUNG Bib. Since 1963. Cantonese cuisine. TAKEYA Bib. Traditional Japanese cuisine. TAM'S YUNNAN NOODLES Bib. Noodles. TASTY (Kowloon Bay) Bib. Noodles & congee. THE BOSTONIAN - steakhouse. At The Langham hotel. THE CHINESE RESTAURANT (Head chef: Lo Kwai-kai). Chinese cuisine. At Hyatt Regency hotel. THE NEW SANGEET - Indian cuisine. At Inter-Continental Plaza. THE STEAK HOUSE - steakhouse. At InterContinental hotel. TIM HO WAN (MONG KOK) * (Chef: Mak Pui Gor). Dim sum cuisine. World's cheapest Michelin Star restaurant. TIM HO WAN (SHAM SHUI PO) *. Dim sum cuisine. TIN LUNG HEEN *. Cantonese cuisine. On the 102nd floor of The Ritz Carlton hotel. TOKORO - Cantonese cuisine. At Langham Place hotel. TOSCA - Italian cuisine. At The Ritz Carlton hotel. WHISK - French contemporary cuisine. At The Mira hotel. WING HAP LUNG Bib. Cantonese roast meats cuisine. WING LAI YUEN - Chinese cuisine. XIN DAU JI *. Cantonese cuisine. YAN TOH HEEN * (Executive chef: Lau Yiu Fai). Cantonese cuisine. At InterContinental hotel. YAT TUNG HEEN - Cantonese cuisine. At Eaton Hotel. YÉ SHANGHAI **. Shanghainese cuisine. At Marco Polo hotel. CHIUCHOW GARDEN - Chiuchow cuisine. At Tsuen Wan Luk Yeung Galleria. CHUEN KEE SEAFOOD - seafood. FUNG LUM Bib. Cantonese cuisine. HO TO TAI - noodles. Founded in 1949. LEI GARDEN *. Cantonese cuisine. LOAF ON *. Cantonese cuisine. RED SEASONS Bib. Cantonese cuisine. TAI WING WAH Bib. Cantonese cuisine. XIN DAU JI Bib. Cantonese cuisine. YUE KEE Bib. Cantonese cuisine. Founded in 1958. Indian food: The best dishes in each region - CNN travel. Gopi Dining Hall NW. Specialty: kathiyawadi thaali. BADE MIYA - great kebab! Order: chicken tangdi kebab. 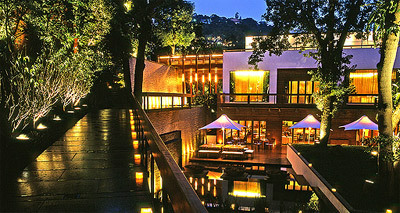 HAKKASAN MUMBAI - will open in Bandra, Mumbai, early in 2011. WASABI BY MORIMOTO sp (Grand executive chef: Oberoi). At The Taj Mahal Palace & Tower. BUKHARA sp. Established in 1977. At the ITC Maurya hotel. INDIAN ACCENT NW. Specialty: foie gras galouti. KARIM'S NW. Probably the world's best curry restaurant. Specialty: lazeez murg saag. MOZAIC GTM (Chef: Christopher Salans). RIVA (Chef: Guruh Nugraha). 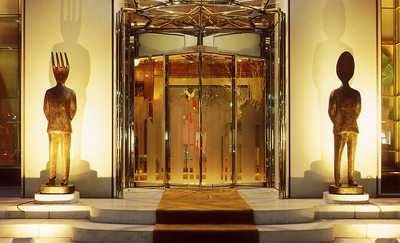 At The Park Lane hotel. Hassho NW. Specialty: savory omelettes. ABON *. Japanese kushiage cuisine. AMBAI * (Chef: Masahiro Sakaguchi). Japanese soba cuisine. AMEFU **. Traditional Japanese cuisine. CÁ SENTO *** (Chef: Shinya Fukumoto). Fusion. CHINA BISTRO EVOLVE *. Chinese cuisine. FUJIHARA *. Japanese tempura cuisine. Since 1941. FUshimi *. Japanese sushi cuisine. GENSAI **. Traditional Japanese cuisine. GYOGIN DOI * (Chef: Yoshiteru Doi). Traditional Japanese cuisine. HASHINO *. Traditional Japanese cuisine. HATADA **. Traditional Japanese cuisine. HYAKUMIDOKORO ONJIKI **. Traditional Japanese cuisine. ISSO *. Traditional Japanese cuisine. JIKISHIN **. Traditional Japanese cuisine. JIN *. Japanese contemporary cuisine. JUENNE * (Chef: Takahiro Okawa). French cuisine. KABURAYA *. Japanese soba cuisine. KATSURA SANSO HORAINOSATO *. Traditional Japanese cuisine. KIMOTO **. Traditional Japanese cuisine. Kobe Kitano Hotel R&C (Chef: Hiroshi Yamaguchi). Japanese fugu cuisine. KOBE KITCHO *. Traditional Japanese cuisine. KOMAGO ***. Traditional Japanese cuisine. KOZARU *. Traditional Japanese cuisine. KYORYORI KUMAGAI *. Traditional Japanese cuisine. MAISON DE GILL *. French cuisine. MATSUKI *. Traditional Japanese cuisine. MATSUyoshi *. Traditional Japanese cuisine. MIKI *. Traditional Japanese cuisine. MIYASU *. Steakhouse. Since 1960. MURAGEN ARIMA *. Japanese soba cuisine. MURAGEN ASHIYAGAWA *. Japanese soba cuisine. NAGASAKA *. Traditional Japanese cuisine. OKATANI *. Traditional Japanese cuisine. ROAN MATSUDA *. Japanese soba cuisine. SAKANA KISHI *. Traditional Japanese cuisine. SANKAYO **. Traditional Japanese cuisine. SETSUGETSUKA * (Chef: Tomohiro Yamaguchi). Japanese teppanyaki cuisine. SHIRAHAMA *. Traditional Japanese cuisine. SHOKUSAIKOBO HARUNO *. Japanese izakaya. SOBAKIRI YAMAOYAJI *. Japanese soba cuisine. SUSHI EMIKO *. Japanese sushi cuisine. SUSHI KANBE *. Japanese Edomae sushi cuisine. At Oriental Hotel. SUSHI KISSUI **. Japanese sushi cuisine. SUSHI MATSUMOTO **. Japanese sushi cuisine. TACHIKI *. Steakhouse. Since 1979. TAKAGI **. Traditional Japanese cuisine. TEMPURA & WINE IWAI *. Japanese tempura cuisine. TOKYO CHIKUYO-TEI *. Japanese unagi cuisine. TORI-ICHIZU *. Japanese yakitori cuisine. UEMURA *. Traditional Japanese cuisine. UKANYA *. Japanese soba cuisine. WAKAISHOKU KANAYAMA *. Traditional Japanese cuisine. YAMANAKA **. Japanese tempura cuisine. YOZAN *. Traditional Japanese cuisine. AJI RAKUZAN *. Traditional Japanese cuisine. AJIRO *. Since 1962. Japanese shojin cuisine. AKAI * (Chef: Hiroki Abe). Traditional Japanese cuisine. ANKYU **. Traditional Japanese cuisine. Arashiyama Kitcho *** (Chef: Kunio Tokuoka). AWATA *. Traditional Japanese cuisine. At Hotel Okura. AWATA SANSO *. Traditional Japanese cuisine. CHIHANA *** (Chef: Katsuyoshi Nagata). Traditional Japanese cuisine. CHIHIRO **. Traditional Japanese cuisine. DAIKIKU *. Traditional Japanese cuisine. FUJIWARA *. Traditional Japanese cuisine. FUKIAGE **. Traditional Japanese cuisine. GION MARUYAMA **. Traditional Japanese cuisine. 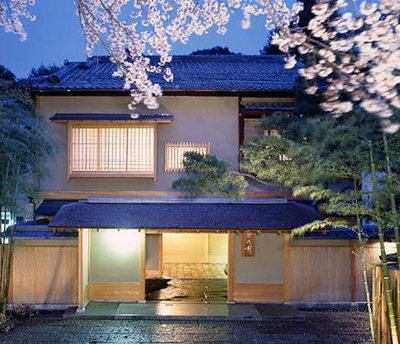 GION MATAYOSHI **. Traditional Japanese cuisine. gion matsudaya * (Chef: Kazunori Matsuda). Japanese sushi. GION MATSUMURO **. Traditional Japanese cuisine. GION NAKAHARA *. Traditional Japanese cuisine. 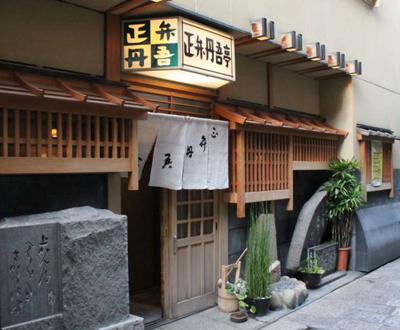 GION NANBA * (Chef: Osamu Nanba). Traditional Japanese cuisine. 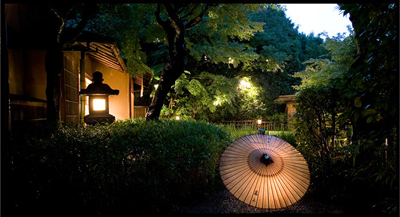 GION NISHIKAWA **. Traditional Japanese cuisine. GION NISHIMURA *. Traditional Japanese cuisine. GION OKADA *. Traditional Japanese cuisine. GION OWATARI *. Traditional Japanese cuisine. GION SASAKI **. Traditional Japanese cuisine. 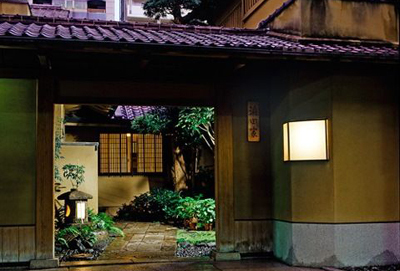 GION SUETOMO **. Traditional Japanese cuisine. 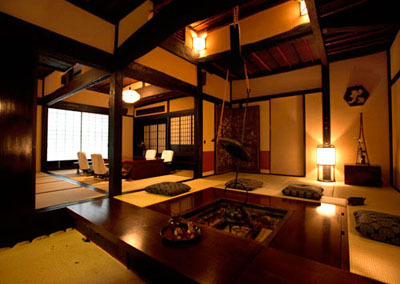 GION U *. Japanese unagi cuisine. HAMASAKU **. Traditional Japanese cuisine. HANA KITCHO *. Traditional Japanese cuisine. HANAMURA **. Traditional Japanese cuisine. HASSUN **. Traditional Japanese cuisine. HAYASHI *. Traditional Japanese cuisine. HIROKAWA *. Japanese unagi cuisine. HOKKORIYA *. Japanese obanzai cuisine. HYOTEI ***. Traditional Japanese cuisine. ICHI NO HUNAIRI *. Chinese cuisine. ICHIYOSHI *. Traditional Japanese cuisine. IFUKI *. Traditional Japanese cuisine. Iida *. Traditional Japanese cuisine. IKUTA *. Traditional Japanese cuisine. ISSHIN **. Japanese beef specialties. IWASAKI *. Traditional Japanese cuisine. JIKI MIYAZAWA * (Chef: Masato Miyazawa). Traditional Japanese cuisine. jikishinbo saiki *. Traditional Japanese cuisine. JINROKU *. Japanese soba cuisine. Kamigamo Akiyama * (Chef: Naohiro Akiyama). Traditional Japanese cuisine. KANEI *. Japanese soba cuisine. KANJIN *. Traditional Japanese cuisine. kawakami *. Traditional Japanese cuisine. kennin-ji gion maruyama **. Traditional Japanese cuisine. kichisen **. Traditional Japanese cuisine. Kikunoi Honten *** (Chef: Yoshihiro Murata). Traditional Japanese cuisine. kikunoi roan **. Traditional Japanese cuisine. 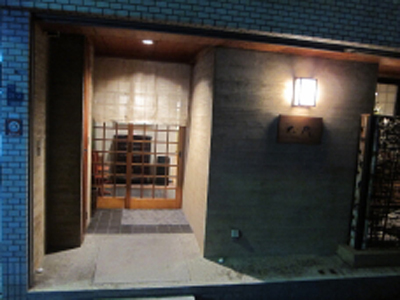 kitcho arashiyama honten *** (Chef: Tokuoka). Traditional Japanese cuisine. kyoboshi **. Japanese tempura cuisine. kyoyuke yokikana *. Traditional Japanese cuisine. maehara *. Japanese unagi cuisine. mankamero **. Traditional Japanese cuisine. Since 1716.
mashita * (Chef: Masahiro Mashita). Traditional Japanese cuisine. masuda *. Traditional Japanese cuisine. mita *. Traditional Japanese cuisine. mitsuyasu **. Traditional Japanese cuisine. MIZAI *** (Chef: Hitoshi Ishihara). Traditional Japanese cuisine. mokube *. Traditional Japanese cuisine. nakamura *** (Chef: Motokazu Nakamura). Traditional Japanese cuisine. Nakazen *. Traditional Japanese cuisine. Nikyo *. Traditional Japanese cuisine. Ogami *. Traditional Japanese cuisine. Ogata **. Traditional Japanese cuisine. Ogawa *. Traditional Japanese cuisine. Okina *. Traditional Japanese cuisine. onikutoyasai hachibe *. Japanese beef specialties. rikichi *. Traditional Japanese cuisine. ryozanpaku ** (Chef: Kenichi Hashimoto). Traditional Japanese cuisine. ryuheisoba *. Japanese soba cuisine. Sakamoto *. Traditional Japanese cuisine. sakanatoosake gotoshi *. Japanese izakaya. sakurada ** (Chef: Isuzu Sakurada). Traditional Japanese cuisine. sakuragawa gion *. Traditional Japanese cuisine. sakuragawa kiyamachi *. Traditional Japanese cuisine. sangencha * (Chef: Nobuhiko Masuda). Traditional Japanese cuisine. seike nishijin *. Japanese yuba cuisine. Seto *. Japanese chicken specialties. Shoku Kobo Hirosaki *. Traditional Japanese cuisine. Shunseki Suzue **. Traditional Japanese cuisine. Shunshin an * (Chef: Kensaku Nakano). Traditional Japanese cuisine. Sobaya Nicolas *. Japanese soba cuisine. sojiki nakahigashi ** (Chef: Hisao Nakahigashi). Traditional Japanese cuisine. sottaku tsukamoto **. Traditional Japanese cuisine. 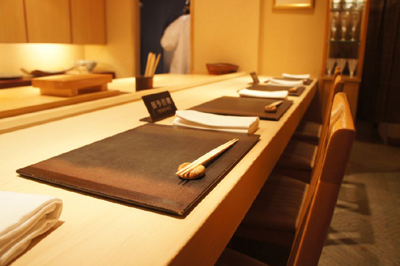 sushi imai *. Japanese sushi. sushi matsumoto **. Japanese sushi. sushi yoshida *. Japanese sushi. tankuma honke **. Traditional Japanese cuisine. tankuma kitamise honten * (Chef: Masahiro Kurisu). Traditional Japanese cuisine. Founded in 1928.
tenyou *. Japanese tempura cuisine. tomikyu *. Japanese fugu cuisine. tomoe *. Japanese fugu cuisine. toriyasa *. Japanese chicken specialties. 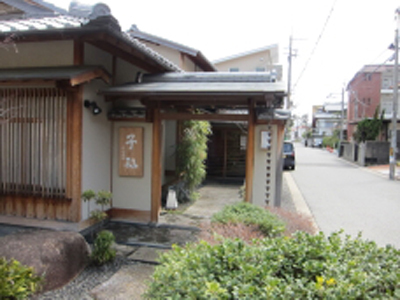 Established in 1788.
tozen-tei * (Chef: Toshiro Watanabe). Traditional Japanese cuisine. Tsuruya ***. Traditional Japanese cuisine. Since 1928.
uosaburo *. Traditional Japanese cuisine. Founded in 1764.
uozuya *. Traditional Japanese cuisine. wagokoro izumi **. Traditional Japanese cuisine. wakuden kodaiji **. Traditional Japanese cuisine. wakuden muromachi *. Traditional Japanese cuisine. yonemura * (Chef: Masayasu Yonemura). Fusion. Zen *. Japanese soba cuisine. Ajinokaze Nishimura *. Traditional Japanese cuisine. Ajinotabibito Roman *. Traditional Japanese cuisine. Gen *. Japanese soba cuisine. Hanagaki **. Traditional Japanese cuisine. Inakajaya Chie *. Traditional Japanese cuisine. Kakomura * (Chef: Toshihiko Kakomura). Traditional Japanese cuisine. 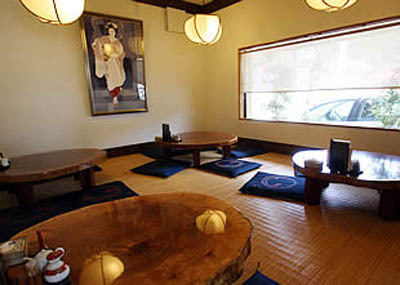 Kappo Kitada *. Traditional Japanese cuisine. Kawanami * (Chef: Masaaki Okuda). Traditional Japanese cuisine. Kiyosuminosato Awa *. Traditional Japanese cuisine. Kobe-tei * (Chef: Ryoji Kishi). Japanese kushiage cuisine. Opened in 1981. Kotan *. Traditional Japanese cuisine. La Cachette *. French cuisine. Le Benkei * (Chef: Kinji Ogawa). French cuisine. Manso *. Traditional Japanese cuisine. Masuda *. Japanese kushiage cuisine. Musoan **. Traditional Japanese cuisine. Onjaku **. Traditional Japanese cuisine. Seki *. Japanese teppanyaki cuisine. Shokunomadoi Nazuna *. Japanese contemporary cuisine. Sobakiri Hikoemon *. Japanese soba cuisine. 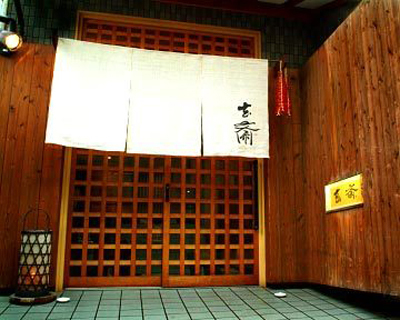 Soba Saishoku Ichinyoan *. Japanese soba cuisine. Wa Yamamura *** (Chef: Nobuharu Yamamura). Traditional Japanese cuisine. Yuza *. Japanese Edomae sushi cuisine. ACCUEILLIR ** (Chef: Kenji Nakata). French contemporary cuisine. Ajikitcho bunbuan *. Traditional Japanese cuisine. Ajikitcho daimaru shinsaibashi *. Traditional Japanese cuisine. Ajikitcho daimaru horie **. Traditional Japanese cuisine. Ajinakaori Yamawaki *. Traditional Japanese cuisine. Ayamedo *. Japanese soba cuisine. Ayamuya *. Japanese yakitori cuisine. Bon *. Japanese kushiage cuisine. ConvivialitÉ * (Chef: Hideaki Yasuo). French cuisine. Fujikyu *. Traditional Japanese cuisine. FUJIYA 1935 *** (Chef: Tetsuya Fujiwara). Fusion cuisine. funakoshisaketen wataru *. Japanese izakaya. Gyuho * (Chef: Matsutaro Nakai). 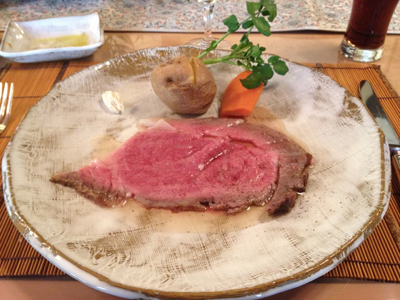 Japanese beef specialities. HAJIME *** (Chef: Hajime Yoneda). French cuisine. Hashimoto *. Traditional Japanese cuisine. Hiraishi *. Japanese tempura cuisine. Honda * (Chef: Satoru Honda). Traditional Japanese cuisine. Honkogetsu **. Traditional Japanese cuisine. Ichijunisai ueno mino **. Traditional Japanese cuisine. Ichijunisai ueno toyonaka *. Traditional Japanese cuisine. imamura *. Traditional Japanese cuisine. Ippoh Honten *. Japanese tempura cuisine. kagaman * (Chef: Hiroo Saka). Traditional Japanese cuisine. Kaishoku Shimizu *. Traditional Japanese cuisine. Kantome *. Traditional Japanese cuisine. Kashiwaya R&C *** (Chef: Hideaki Matsuo). Traditional Japanese cuisine. kasho **. Traditional Japanese cuisine. kigawa *. Traditional Japanese cuisine. kigawa asai *. Traditional Japanese cuisine. kiichi *. Traditional Japanese cuisine. kinsui *. Traditional Japanese cuisine. kitahachi ** (Chef: Kiichi Kitahama). Japanese fugu cuisine. kitamura *. Japanese sukiyaki cuisine. Founded in 1881. Kokyu *. Chinese cuisine. At The Westin Osaka hotel. Konoha * (Chef: Katsumi Tanaka). Traditional Japanese cuisine. Koryu *** (Head chef: Shintaro Matsuo). Traditional Japanese cuisine. La Baie * (Chef: Christophe Gibert). French cuisine. At The Ritz-Carlton hotel. LA BÉCASSE GTM R&C (Chef: Yoshinori Shibuya). French cuisine. La Cime *. French cuisine. Le Comptoir de Benoit *. French cuisine. Le Pont de Ciel *. French cuisine. LUMIÈRE * (Chef: Yasushi Karato). French contemporary cuisine. Makino *. Japanese soba cuisine. Man *. Japanese tempura cuisine. Man u *. Japanese oden cuisine. Man u Bekkan *. Japanese oden cuisine. Marusaku *. Traditional Japanese cuisine. Masuda ** (Chef: Yoshichika Masuda). Traditional Japanese cuisine. matsumoto dojima *. Traditional Japanese cuisine. matsumoto eiraku * (Chef: Genzo Matsumoto). Traditional Japanese cuisine. matsuya *. Traditional Japanese cuisine. nagahori * (Chef: Shigeo Nakamura). Japanese izakaya. naniwa okina *. Japanese soba cuisine. noguchi taro *. Japanese contemporary cuisine. notoya *. Japanese oden cuisine. rogetsu *. Traditional Japanese cuisine. 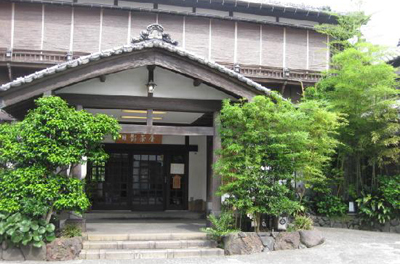 Established in 1927.
rokukaku-tei *. Japanese kushiage cuisine. sakanadokoro koetsu * (Chef: Minoru Harada). Traditional Japanese cuisine. sakuichi honten *. Traditional Japanese cuisine. sakurae toyonaka ** (Chef: Kenji Mitsuda). Japanese contemporary cuisine. sennarizushi *. Japanese Edomae sushi. shien *. Traditional Japanese cuisine. Opened in 1953.
shintaro *. Japanese tempura cuisine. Shunsaiten Tsuchiya ** (Chef: Yukihiko Tsuchisaka). Japanese tempura cuisine. shunsai yamasaki *. Traditional Japanese cuisine. shunsenwaraku sanai *. Traditional Japanese cuisine. shunzentamuzake soan *. Japanese izakaya. sobagiri masa *. Japanese soba cuisine. sobakiko *. Japanese soba cuisine. sobakiri bongu *. Japanese soba cuisine. sobakiri karani *. Japanese soba cuisine. sobakiri tsutaya *. Japanese soba cuisine. sushi Harasho * (Chef: Kou Ishikawa). Japanese sushi. sushi jinsei * (Chef: Tetsuji Basho). Japanese sushi. sushi minazuki *. Japanese sushi. sushi saeki *. Japanese sushi. sushidokoro hirokawa *. Japanese sushi. sushidokoro kurosugi * (Chef: Akihiro Kurosugi). Japanese sushi. sushidokoro sakau *. Japanese sushi. taian *** (Chef: Hitoshi Takahata). Traditional Japanese cuisine. takama *. Japanese soba cuisine. takoyasu **. Japanese fugu cuisine. tamura *. Japanese fugu cuisine. Since 1967.
tenshige *. Japanese tempura cuisine. tensho *. Japanese soba cuisine. tetsuya ishihara *. French cuisine. tokiwa *. Traditional Japanese cuisine. tominoya *. Japanese oden cuisine. totoya ** (Chef: Takeshi Yokoo). Traditional Japanese cuisine. Tout le Monde *. French cuisine. umazake kamunabi *. Japanese izakaya. umeichi * (Chef: Takamitsu Okuda). Traditional Japanese cuisine. unisson des Curs *. French contemporary cuisine. Wasabi *. Japanese kushiage cuisine. wayoyuzen nakamura *. Japanese contemporary cuisine. Xiang Tao * (Chef: Wong Ching Tui). Chinese cuisine. At The Ritz-Carlton hotel. Yoshiko * (Chef: Shinya Yoshida). Japanese fugu cuisine. Yoshino * (Chef: Kazuhito Uchiya). Traditional Japanese cuisine. Yoshitome *. Traditional Japanese cuisine. Yotaro Honten **. Japanese tempura cuisine. Since 1921. Yuno *. Traditional Japanese cuisine. Bonzo *. Japanese soba cuisine. Gentoan *. Traditional Japanese cuisine. Hachinoki Kitakamakura *. 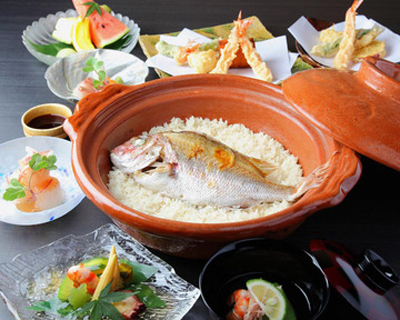 Japanese shojin cuisine. Since 1979. Hamura * (Chef: Kunio Sekizawa). Japanese tempura cuisine. Herlequin Bis *. French cuisine. Hikagechaya *. Traditional Japanese cuisine. Izumi *. Japanese sushi cuisine. Kamakurayama *. Japanese beef specialities. Since 1970. Kisei *. Traditional Japanese cuisine. Koan ***. Traditional Japanese cuisine. Kuikiri Hirayama *. Traditional Japanese cuisine. Kuniyoshi *. Japanese unagi cuisine. Founded in 1803. Pleins d'Herbes *. French cuisine. Ren *. Traditional Japanese cuisine. Shirako *. Traditional Japanese cuisine. Shunsai Sekine *. Traditional Japanese cuisine. Soba Hirai *. Japanese soba cuisine. Taku-tei *. Traditional Japanese cuisine. Tamoto *. Traditional Japanese cuisine. Ten ichibo *. Japanese tempura cuisine. Teuchisoba Okamura *. Japanese soba cuisine. Tomoei *. Japanese unagi cuisine. Tsuruya *. Japanese unagi cuisine. Opened in 1929. Ukyo *. Traditional Japanese cuisine. Yonekura *. Traditional Japanese cuisine. Yunoki *. Traditional Japanese cuisine. Opened in 1980. Kokin Aoyagi R&C (Chef: Hirohisa Koyama). 7CHOME KYOBOSHI *** (Chef: Shigeya Sakakibara). Japanese tempura (fish and vegetables deep-fried in a light batter). AIMÉE VIBERT ** (Chef: Toshinori Wakatsuki). French cuisine. AJIMAN ** (Chef: Sadao Matsubara). Japanese fugu (literally "river pig", pufferfish). AJISEN *. Japanese izakaya (Japanese-style pub). 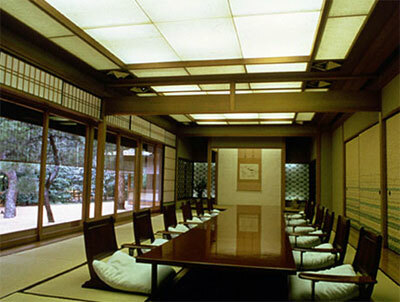 AKASAKA TAN-TEI *. Traditional Japanese cuisine. AKIMOTO *. Japanese unagi (eel). ÀNU RETROUVEZ-VOUS * (Chef: Shohei Shimono). French contemporary cuisine. ARAGAWA *. Steakhouse. 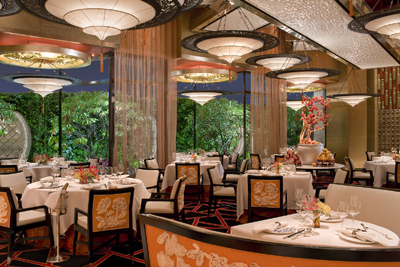 World's most expensive restaurant (Forbes.com 2006). Japanese homepage: ARAGAWA. ARAKI ***. Japanese sushi. Boasts some of the finest tuna in Tokyo. ARGENTO ASO *. Italian contemporary cuisine. AROMA FRESCA *. Italian contemporary cuisine. ASAGI * (Chef: Hiroshi Asagi). Japanese tempura (fish and vegetables deep-fried in a light batter). AU GOÛT DU JOUR NOUVELLE ÈRE * (Chef: Shintaro Miyazaki). French contemporary cuisine. AZABU ROKKAKU *. Japanese izakaya (Japanese-style pub). AZABU YUKIMURA *** (Chef: Jun Yukimura). Traditional Japanese cuisine. 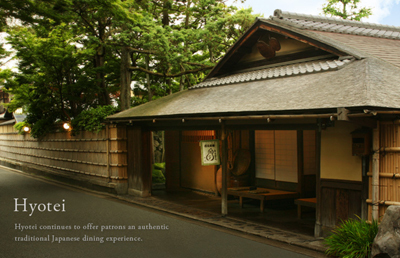 Widely known as the most exclusive restaurant in Japan. BANREKIYUKODO *. Japanese contemporary cuisine. BEIGE ALAIN DUCASSE ** (Executive chef: Kei Kojima). French contemporary cuisine. BENOIT TOKYO - Executive chef: Kei Kojima. BIRD LAND *. Japanese yakitori (chicken pieces grilled on a skewer). BON CHEMIN *. French cuisine. 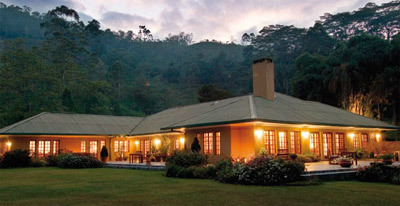 BULGARI RESTAURANTS *. Italian contemporary cuisine. 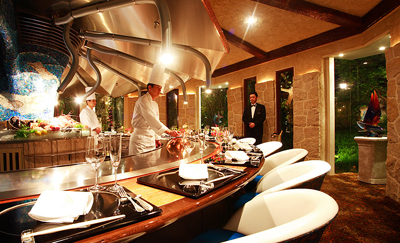 CASA VINITALIA * (Chef: Shinji Harada). Italian cuisine. CHEZ MATSUO *. French cuisine. CHINA BLUE *. Chinese cuisine. On the 28th floor of the Conrad hotel. CHUGOKU HANTEN FUREIKA **. Chinese cuisine. CÔTE D'OR * (Chef: Masao Saisu). French cuisine. CRESCENT ** (Chef: Isogai Takashi). French cuisine. CUISINE[S] MICHEL TROISGROS **. French contemporary cuisine. At HYatt Regency hotel. DAIGO **. Japanese shojin (Buddhist vegetarian dishes). DAIWA SUSHI - Tokyo's best sushi restaurant. DONS DE LA NATURE *. Steakhouse. ECHIKATSU *. Japanese sukiyaki (hot pot dish with slices of beef and various vegetables, usually cooked at the table). Founded in 1871. ÉDITION KOJI SHIMOMURA ** (Chef: Koji Shimomura). French contemporary cuisine. EDOSOBA HOSOKAWA *. Japanese soba (buckwheat noodles). ÉMUN *. French contemporary cuisine. ESAKI *** (Chef: Shintaro Esaki). Japanese contemporary cuisine. FARO * (Chef: Takahiro Nakao). Italian cuisine. FEU *. French contemporary cuisine. FLORILÈGE * (Chef: Hiroyasu Kawate). French contemporary cuisine. FUGU FUKUJI ** (Chef: Takeshi Yasuge). Japanese fugu (literally "river pig", pufferfish). FUKAMACHI *. Japanese tempura (fish and vegetables deep-fried in a light batter). FUKUDAYA **. Traditional Japanese cuisine. FUKUJU **. Traditional Japanese cuisine. GAIGAI NW. Yakitori cuisine. Specialty: barbecued chicken. GINZA OKUDA ** (Chef: Tooru Okuda). Traditional Japanese cuisine. GINZA TOYODA **. Traditional Japanese cuisine. GORDON RAMSEY *. French cuisine. At Conrad hotel. GORIO *. Steakhouse. Serves Tajima Sanda beef. GRILL UKAI *. European cuisine. HAMADAYA ***. Traditional Japanese cuisine. HARUTAKA * (Chef: Harutaka Takahashi). Japanese sushi. HASHIMOTO *. Japanese unagi (eel). (Founded 1835. HATANAKA *. Japanese tempura (fish and vegetables deep-fried in a light batter). HIFUMI-AN **. Traditional Japanese cuisine. HIRAMATSU * GTM (Chef: Hiroyuki Hiramatsu). French cuisine. 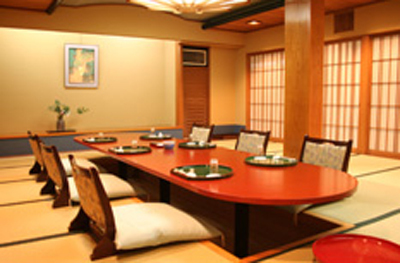 HIRAMATSU RESTAURANTS - list of all restaurants. HIROSAKU *. Traditional Japanese cuisine. HISHINUMA ** (Chef: Takayuki Hishinuma). Traditional Japanese cuisine. HIYAMA *. Japanese sukiyaki (hot pot dish with slices of beef and various vegetables, usually cooked at the table). HORIKANE **. Traditional Japanese cuisine. IBUKI *. Traditional Japanese cuisine. ICHIGO *. Japanese oden (various ingredients stewed in a thin soy soup). ICHIMONJI ** (Chef: Kazuhiko Hirose). Traditional Japanese cuisine. ICHIRIN **. Traditional Japanese cuisine. ISHIBASHI *. Japasene unagi (eel). Ishikawa ***. Traditional Japanese cuisine. ITOSHO *. Japanese shojin (Buddhist vegetarian dishes). IZUMI *. Japanese fugu (literally "river pig", pufferfish). JoËl Robuchon *** GTM R&C (Chef: Alain Verzeroli). French contemporary cuisine. KADOWAKI ** (Chef: Toshiya Kadowaki). Traditional Japanese cuisine. KAGURA *. Traditional Japanese cuisine. KAMIYA NOGIZAKA *. Traditional Japanese cuisine. KANDA ***. Traditional Japanese cuisine. KASANE *. Traditional Japanese cuisine. KATSUZEN *. Japanese tonkatsu (pork cutlet). KIKUCHI **. Traditional Japanese cuisine. KIKUNOI **. Traditional Japanese cuisine. KM ** (Chef: Kiyoshi Miyashiro). French cuisine. KODAMA ** (Chef: Tsutomu Kodama). Japanese contemporary cuisine. KOGETSU **. Traditional Japanese cuisine. KOHAKU **. Japanese contemporary cuisine. KOJYU ***. Traditional Japanese cuisine. 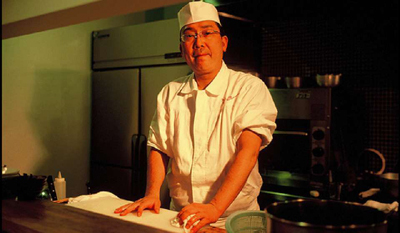 KOMURO ** (Chef: Mitsuhiro Komuro). Traditional Japanese cuisine. KONDO **. Japanese tempura (fish and vegetables deep-fried in a light batter). KUROGI * (Chef: Jun Kurogi). Traditional Japanese cuisine. KYORAKU-TEI *. Japanese soba (buckwheat noodles). KYOTO TSURUYA - at The Peninsula. L'ANNEAU D'OR *. French cuisine. 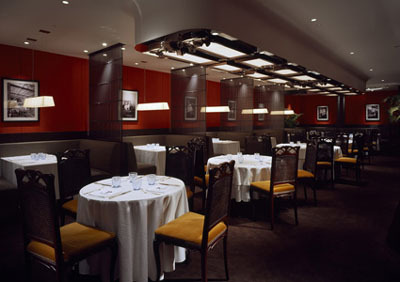 L'ATELIER DE JoËl Robuchon **. French contemporary cuisine. LA BOMBANCE * (Chef: Makoto Okamoto). Japanese contemporary cuisine. 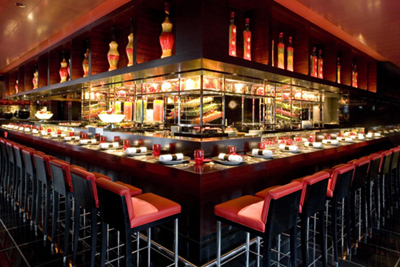 LA TABLE DE JoËl Robuchon **. French contemporary cuisine. LA TOUR * (Chef: Tadaaki Shimizu). French cuisine. LA TOUR D'ARGENT * GTM (Chef: Alexandre Trancher). French cuisine. LAUBURU * (Chef: Shinichiro Sakurai). French cuisine. LE BOURGUIGNON * (Chef: Yoshinaru Kikuchi). French cuisine. L'EFFERVESCENCE * (Chef: Shinobu Namae). French contemporary cuisine. LE JEU DE L'ASSiETTE *. French contemporary cuisine. LE MANGE-TOUT ** (Chef: Noboru Tani). French cuisine. 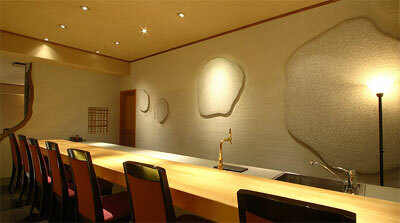 L'EMBELLIR * (Chef: Naoto Kishimoto). French contemporary cuisine. LES CRÉATIONS DE NARISAWA ** SP (Chef: Yoshihiro Narisawa). French contemporary cuisine. LES ENFANTS GÂtÉS * (Chef: Haraguchi). French cuisine. LES ROSIERS EGUZKILORE *. French cuisine. LES SAISONS * (Chef: Voisin). French cuisine. At the Imperial Hotel. L'OSIER *** (Chef: Bruno Menard). French cuisine. LUGDUNUM BOUCHON LYONNAIS * (Chef: Christophe Paucod). French cuisine. MAISON PAUL BOCUSE *. French cuisine. MAKIMURA **. Traditional Japanese cuisine. MASA'S KITCHEN 47 *. Chinese cuisine. MASUMI * (Chef: Tsukasa Masui). Traditional Japanese cuisine. MIKAWA ZEZANKYO *. Japanese tempura (fish and vegetables deep-fried in a light batter). MIKUNI GTM (Chef: Kiyomi Mikuni). MINOICHI *. Traditional Japanese cuisine. MONNA LISA EBISU * (Chef: Toru Kawano). French cuisine. MONNA LISA MARUNOUCHI * (Chef: Toru Kawano). French cuisine. MOTOYOSHI * (Chef: Kazuihito). Japanese tempura (fish and vegetables deep-fried in a light batter). MUROI *. Traditional Japanese cuisine. MUTO *. Japanese soba (buckwheat noodles). NABEYA *. Traditional Japanese cuisine. Founded in 1935. NADAMAN HONTEN SAZANKA-SO ** (Master chef: Nobutoshi Kiura). Traditional Japanese cuisine. Since 1830. NAGAZUMI *. Traditional Japanese cuisine. NAKAJIMA *. Traditional Japanese cuisine. NE QUITTEZ PAS - "Fresh seafood from Misaki, Kanagawa and vegetables, soil... Unique French cuisine in a relaxing atmosphere." NICO *. Traditional Japanese cuisine. Nihonryori RyuGin SP (Chef: Seiji Yamamoto). NODAIWA * (Chef: Kanejiro Kanemoto). Japanese unagi (eel). OBANA *. Japanese unagi (eel). OGASAWARA HAKUSHAKU-TEI *. Spanish contemporary cuisine. Founded in 1927. OHARA'S * (Chef: Kei Ohara). French cuisine. OKINA *. Japanese soba (buckwheat noodles). OZAKI *. Traditional Japanese cuisine. PIATTO SUZUKI *. Italian cuisine. 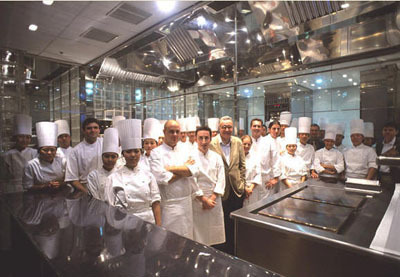 PIERRE GAGNAIRE *** (Chef: Pierre Gagnaire). French contemporary cuisine. On the 36th floor of ANA InterContinental hotel. 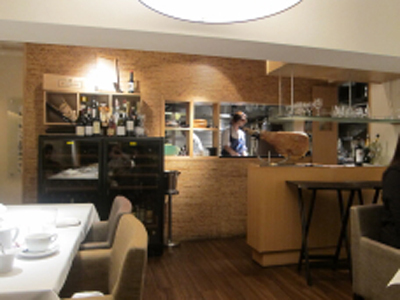 Quintessence *** sp (Chef: Shuzo Kishida). French contemporary cuisine. Belongs to Eater.com's list of the 11 toughest restaurants to get a reservation in the world. RAKU-TEI ** (Chef: Shuji Ishikura). Japanese tempura (fish and vegetables deep-fried in a light batter). RAMEN JIRO - Tokyo's best noodles. 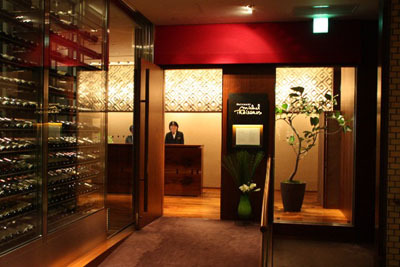 RESTAURANT HÔTEL DE MIKUNI R&C (Chef: Kiyomi Mikuni). RÉVÉRENCE *. French contemporary cuisine. 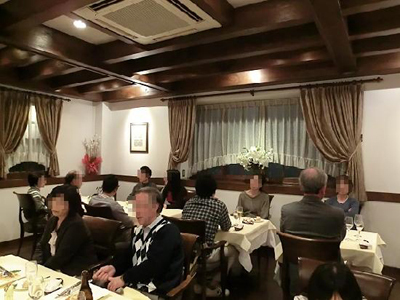 RISTORANTE ASO * (Chef: Tatsuji Aso). Italian contemporary cuisine. 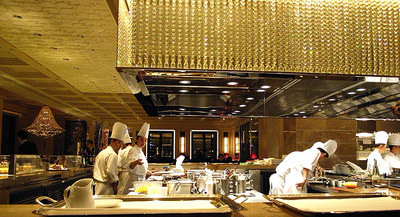 RISTORANTE HONDA * (Chef: Tetsuya Honda). Italian contemporary cuisine. RISTORANTE LA PRIMULA *. Italian contemporary cuisine. ROKUKAKU-TEI *. Japanese kushiage (deep-fried skewers). RYUGIN *** (Chef: Seiji Yamamoto). Japanese contemporary cuisine. RYUZU * (Chef: Ryuta Iizuka). French cuisine. SAKURAGAWA * (Chef: Yoshiaki Kurahashi). Traditional Japanese cuisine. SANDA *. Japanese beef specialities. SANGOAN *. Japanese soba (buckwheat noodles). SANKAME * (Chef: Isao Nanjo). Founded in 1946. Traditional Japanese cuisine. SANT PAU R&C (Chefs: Carme Ruscalleda & Mariano Gaspar Gallego). Spanish contemporary. SEIJU * (Chef: Yoshiaki Shimizu). Japanese tempura (fish and vegetables deep-fried in a light batter). SEISOKA **. Traditional Japanese cuisine. 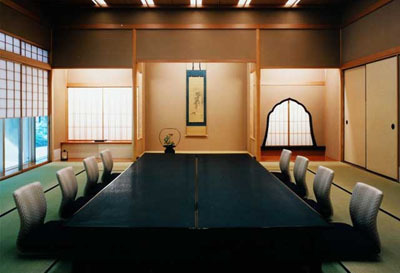 SEKIHO-TEI **. Traditional Japanese cuisine. SENSE * SDA. Chinese cuisine. At Mandarin Oriental hotel. SHIGEYOSHI ** (Chef: Kenzo Sato). Traditional Japanese cuisine. SHINSUKE *. Japanese izakaya (Japanese-style pub). Founded in 1924. SHOFUKURO *. 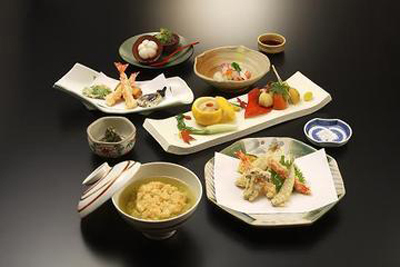 Japanese kaiseki (traditional multi-course Japanese meal). On the 36th floor of the Marunouchi building. SHUNNOAJI-ICHI *. Traditional Japanese cuisine. SIGNATURE * SDA. French contemporary cuisine. On the 37th floor of Mandarin Oriental hotel. SOBA MIWA *. Japanese soba (buckwheat noodles). 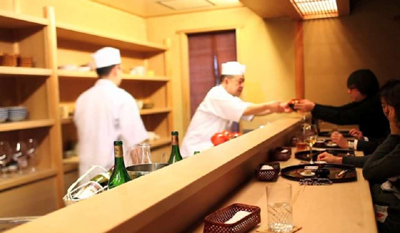 Sukiyabashi Jiro Honten *** NW (Chef: Jiro Ono). Japanese sushi. Specialty: toro sushi. 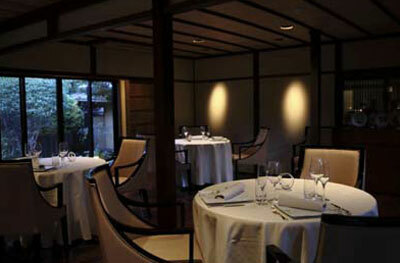 World's smallest 3-starred Michelin restaurant (ten counter seats and three tables). Belongs to Eater.com's list of the 11 toughest restaurants to get a reservation in the world. Sukiyabashi Jiro Roppongi **. Japanese sushi. 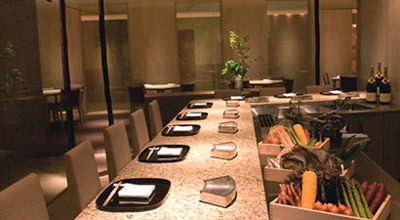 SUSHI AOKI GINZA * (Chef: Toshikatsu Aoki). Japanese sushi. SUSHI FUKUMOTO *. Japanese sushi. SUSHI ICHI *. Japanese sushi. SUSHI ISSHIN ASAKUSA *. Japanese sushi. SUSHI KANESAKA ** (Chef: Shinji Kanesaka). Japanese sushi. Sushi Mizutani *** (Chef: Hachiro Mizutani). Japanese sushi. SUSHI NAKAMURA *. Japanese sushi. Sushi Saito *** (Chef: Takashi Saito). Japanese sushi. 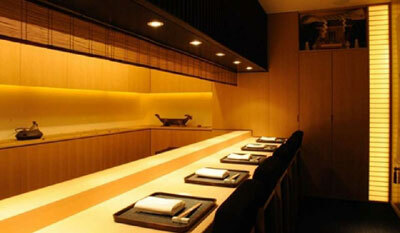 SUSHI SHIN * NW (Chef: Shintaro Suzuki). Japanese sushi. Specialty: angler-fish terrine. SUSHI YOSHITAKE ***. Japanese sushi. 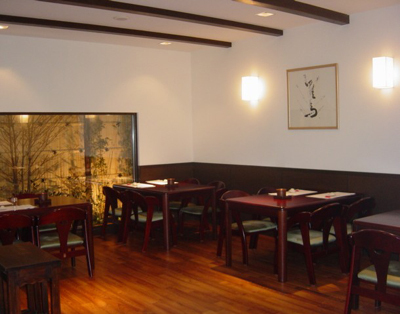 SUSHI ZANMAI - open 24 hours a day Sushi Zanmai is popular with businesspeople who want a reasonably priced sushi meal. SUZUKI *. Traditional Japanese cuisine. SUZUNARI * (Chef: Akihiko Murata). Traditional Japanese cuisine. TAJIMA *. Japanese soba (buckwheat noodles). TAKAHASHI * (Chef: Yuji Takahashi). Japanese yakitori (chicken pieces grilled on a skewer). TAKUMI TATSUHIRO *. Japanese sushi. TAMURA (Chef: Takashi Tamura). Japanese sushi. TATERU YOSHINO GINZA * (Chef: Tateru Yoshino). French contemporary cuisine. TATERU YOSHINO SHIBA ** (Chef: Tateru Yoshino). French cuisine. At Shiba Park Hotel. TATERU YOSHINO SHIODOME * (Chef: Tateru Yoshino). French contemporary cuisine. On the 25th floor of the Shiodome Media Tower. TATSUMURA * (Chef: Masahiko Miyagawa). Traditional Japanese cuisine. TENMO * (Chef: Nobuo Okuda). Founded in 1885. Japanese tempura (fish and vegetables deep-fried in a light batter). TOMURA ** (Chef: Kimio Tomura). Traditional Japanese cuisine. TORIKI * (Chef: Yasuhito Sakai). Japanese yakitori (chicken pieces grilled on a skewer). TORISHIKI *. Japanese yakitori (chicken pieces grilled on a skewer). TORITAMA NW. Yakitori cuisine. Specialty: misaki (chicken tail). TOTOYA UOSHIN *. Traditional Japanese cuisine. TSUJITOME **. Traditional Japanese cuisine. TSUKASA *. Japanese fugu (literally "river pig", pufferfish). TSUKIJI YAMAMOTO **. Japanese fugu (literally "river pig", pufferfish). UCHITSU * (Chef: Takahisa Uchitsu). Japanese tempura (fish and vegetables deep-fried in a light batter). UCHIYAMA *. Traditional Japanese cuisine. UEMURA HONTEN *. Traditional Japanese cuisine. UKAI-TEI GINZA *. 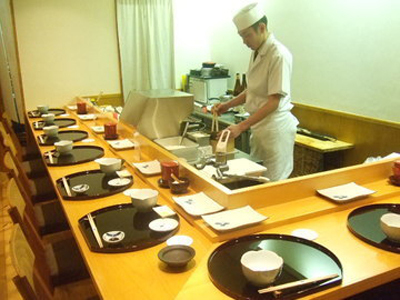 Japanese teppanyaki (cuisine prepared on a hot steel plate in the center of the table). UKAI-TEI OMOTESANDO *. Japanese teppanyaki (cuisine prepared on a hot steel plate in the center of the table). UOTOKU *. Traditional Japanese cuisine. USUKIFUGU YAMADAYA ***. Japanese fugu (literally "river pig", pufferfish). WAKE-TOKUYAMA ** (Chef: Hiromitsu Nozaki). Traditional Japanese cuisine. At InterContinental Tokyo Bay hotel. YAMANOCHAYA *. Japanese unagi (eel). YOKOTA * (Chef: Tsuneo Yokota). Japanese tempura (fish and vegetables deep-fried in a light batter). YONEYAMA * (Chef: Yoneyama). Traditional Japanese cuisine. YOROZUYA OKAGESAN *. 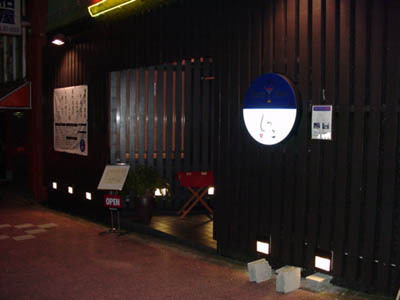 Japanese izakaya (Japanese-style pub). 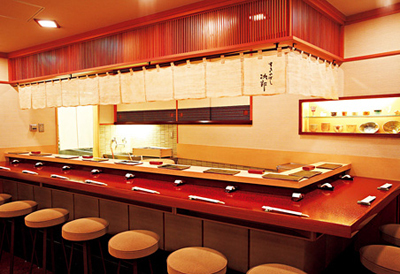 YOSHICHO * (Chef: Kenji Yoshimoto). Japanese yakitori (chicken pieces grilled on a skewer). YOSHIFUKU * (Chef: Kenji Takahashi). Traditional Japanese cuisine. YOSHIHASHI *. Japanese sukiyaki (hot pot dish with slices of beef and various vegetables, usually cooked at the table). YOTARO * (Chef: Motohiro Kawaguchi). Japanese tempura (fish and vegetables deep-fried in a light batter). YOTSUYA UEMURA *. Traditional Japanese cuisine. Yukimura (Chef: Jun Yukimura). Traditional Japanese cuisine. ZURRIOLA * (Chef: Seichi Honda). Spanish contemporary cuisine. Aichiya *. Traditional Japanese cuisine. Azabu Nodaiwa * (Chef: Akio Kanemoto). Japanese unagi cuisine. Chatsubo *. Traditional Japanese cuisine. Chez Naka *. French cuisine. Chiso Kimura **. Traditional Japanese cuisine. Fukunishi *. Japanese tempura cuisine. Furaikyo *. Japanese soba cuisine. Masagosaryo **. Traditional Japanese cuisine. Mizuki *. Traditional Japanese cuisine. Ota Nawanoren *. Japanese sukiyaki cuisine. Rinkaen *. Traditional Japanese cuisine. Sugai **. Traditional Japanese cuisine. Sushi Hachizaemon *. Japanese sushi cuisine. Sushi Hamada *. Japanese Edomae sushi cuisine. Tenhama *. Japanese tempura cuisine. Tenshichi *. Japanese tempura cuisine. Ukai-tei Azamino *. Japanese teppanyaki cuisine. BEIJING KITCHEN - Chinese cuisine. At Grand Hyatt hotel. BELCANÇÃO - international cuisine. At Four Seasons hotel. CANTON (Chef: Mak). Cantonese cuisine. Next to North on the casino floor at The Venetian Resort Hotel. LEI GARDEN *. Cantonese cuisine. At The Grand Canal Shoppes, The Venetian Resort Hotel. YAMAZATO - Japanese cuisine. At Hotel Okura. AUX BEAUX ARTS (Chef: Elie Khalife). French cuisine. At MGM Grand Hotel. 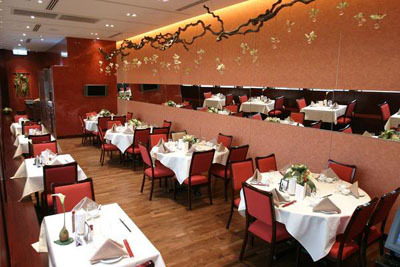 CAFÉ ENCORE - Macanese cuisine. At Wynn hotel. CHAN KUONG KEI - Cantonese cuisine. 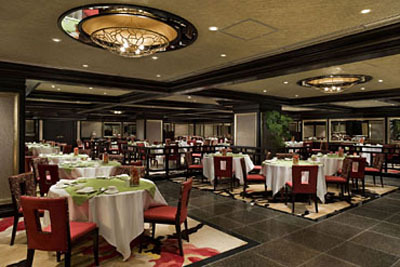 CLUBE MILITAR DE MACAU - Portuguese cuisine. DON ALFONSO 1890 WS. Italian cuisine. At Grand Lisboa Hotel. GOLDEN FLOWER * (Master chef: Liu Guo Zhu). Chinese cuisine. At Wynn hotel. 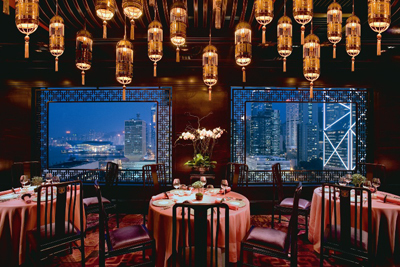 IMPERIAL COURT - Cantonese cuisine. At MGM Grand Hotel. LA PALOMA R&C (Executive chef: Hector Costa Fernandez). Spanish cuisine. 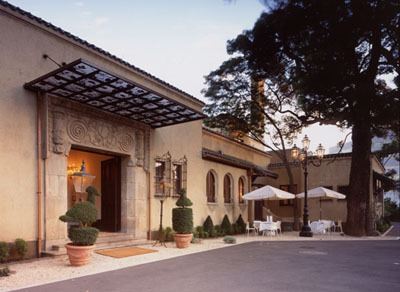 At Pousada de Sao Tiago hotel. LOU KEI Bib. Cantonese cuisine. In Fai Chi Kei. LUK KEI NOODLE Bib. Noodles & congee. LUNG WAH TEA HOUSE - Cantonese cuisine. Ngao Kei Ka Lei Chon - noodles & congee. NOODLE & CONGEE CORNER Bib. Noodles & congee. At Grand Lisboa Hotel. Oja Sopa De Fita Cheung Kei Bib. Noodles & congee. OKADA (Chef de cusine: Anthony Alaimo). Japanese cuisine. At Wynn hotel. 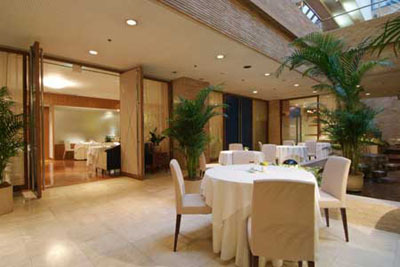 RESTAURANTE LITORAL - Macanese cuisine. RISTORANTE IL TEATRO (Chef de cusine: Anthony Alaimo). Italian cuisine. At Wynn hotel. ROBUCHON AU DÔME *** sp WS. At Grand Lisboa Hotel. SQUARE EIGHT Bib (Chef: Mingo Wan). Chinese cuisine. At MGM Grand Hotel. THE 8 **. Chinese cuisine. At Grand Lisboa Hotel. TIM'S KITCHEN *. Cantonese cuisine. At Hotel Lisboa. TOU TOU KOI - Cantonese cuisine. WING LEI ** (Executive chef: Peter Chan). Cantonese cuisine. At Wynn hotel. A Petisqueira - Portuguese cuisine. SAN TOU TOU - Cantonese cuisine. TENMASA - Japanese cuisine. At Altira hotel. YING - Cantonese cuisine. At Altira hotel. ZI YAT HEEN ** (Chef: Ho). Cantonese cuisine. At Four Seasons hotel. 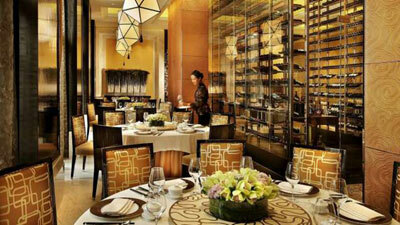 MANDARIN GRILL - at Mandarin Oriental Hotel. 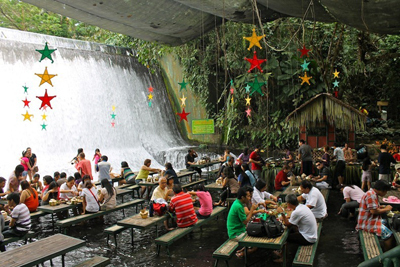 Waterfalls Restaurant - lunch is served on bamboo dining tables set in a few inches of crystalline running water from the falls. ANDRÉ sp (Chef: André Chiang). GUNTHER'S MODERN FRENCH CUISINE sp (Chef: Gunther Hubrechsen). IGGY'S SP (Head chef: Ignatius Chan). At the Hilton Hotel. imperial treasure super peking duck NW. Specialty: crab meat & roe. JAAN SP (Chef de cuisine: Julien Royer). 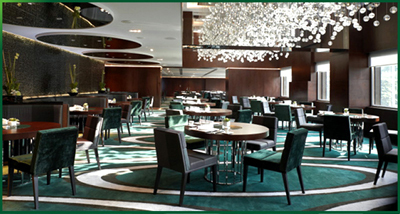 Located on the 70th floor of Swissôtel at The Stamford. 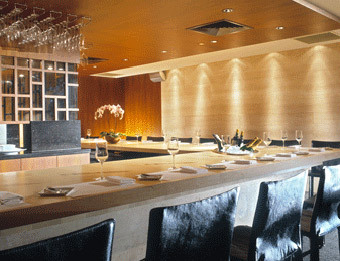 LES AMIS sp WS (Executive chef: Galvin Lim). 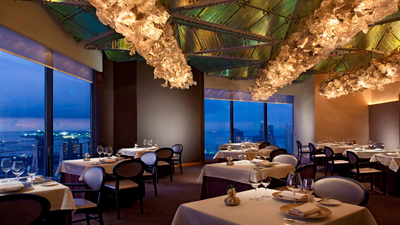 RESTAURANT GUY SAVOY - at Marina Bay Sands. SAINT PIERRE R&C (Chefs: Emmanuel Stroobant & Paul Froggatt). Sungei Road Laksa NW. Specialty: spicy noodle soup. WAKU GHIN SP NW (Chef: Tetsuya Wakuda). Specialty: shrimp & sea urchin. At Marina Bay Sands. 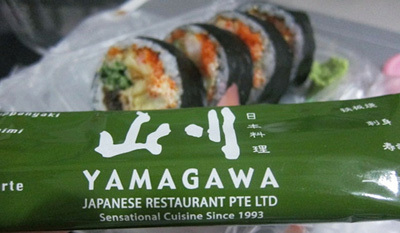 YAMAGAWA - "Sensational Cuisine Since 1993." (Chef: Garry Loh). Japanese cuisine: Teppanyaki, Sashimi & Sushi. 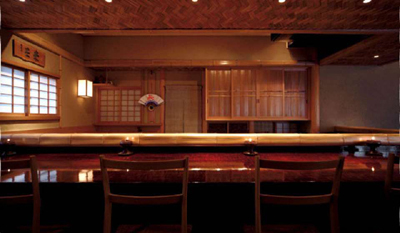 Recipient of the 'Gold Sushi Restaurant Award' at World Sushi Cup Japan 2013. Sasa Sushi Restaurant NW. Specialty: fresh sashimi. 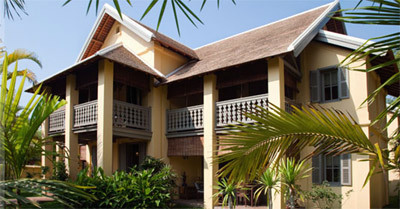 Baan Klang Nam NW. Specialty: grilled river lobster. BED SUPPERCLUB - best described as an upscale restaurant, stage, gallery and club merged into one, where every night is different. Bo.lan NW. 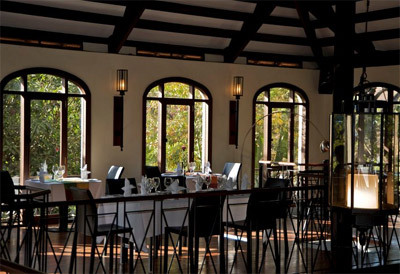 Bo.lan actively strives to serve Thai food at its very best taking full advantage of the fresh and seasonal produce available adopting the Slow food philosophy. Michelin-starred chef: Dylan Jones. Specialty: green curry. Chon Thai Restaurant - at The Siam Hotel. 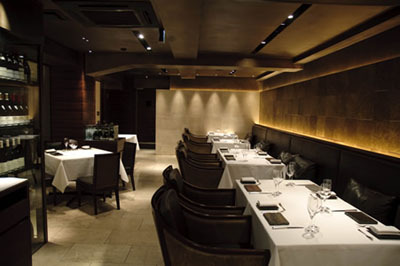 Cloud 47 - "CLOUD 47 is the Fine dining restaurant, Beer Garden and Wine bar." D'SENS - "Located on the 22nd top floor of Dusit Thani hotel offers breathtaking panoramic views over the historical Lumpini Park, and of Bangkok's magnificent skyline. 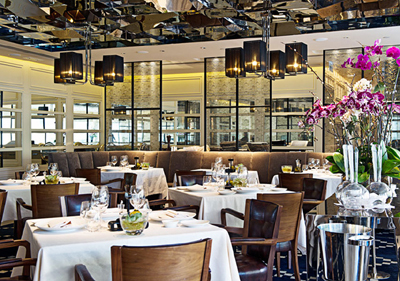 Opened in partnership with the much celebrated Jacques and Laurent Pourcel, who modeled D'Sens on their two-Michelin-Star awarded Le Jardin des Sens restaurant in Montpellier, D'Sens offers the finest French cuisine to be found in Bangkok." gaggan - "Progressive Indian Cuisine." 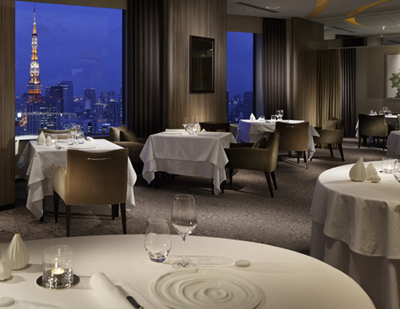 The S.Pellegrino Best Restaurant in Asia 2015. JOK'S KITCHEN NW. Specialty: steamed crabs. LE NORMANDIE GTM. At hotel Mandarin Oriental. 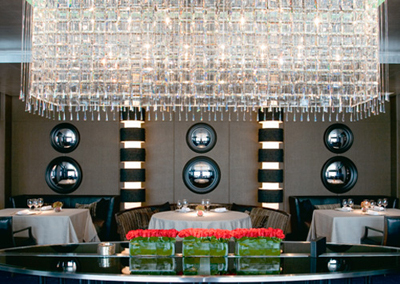 "Considered by many to be the finest French dining experience in Asia." Chef: Carlos Gaudencio. LONG TABLE - "Long Table offers a stunning 25th floor view and trend-setting interior featuring the 25m long table and contemporary video art." 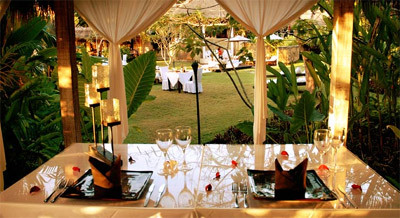 The first restaurant of its kind in the world: the only "Destination Thai Restaurant". Contemporary fine dining. Thai-inspired cuisine. NAHM SP (Chef: (David Thompson). At the Metropolitan Bangkok hotel. RED SKY (Chef de cuisine: Mikko Kataja). Located on the 55th floor of Centara Grand hotel. RESTAURANT KRUA APSORN - traditional Thai food at its best. 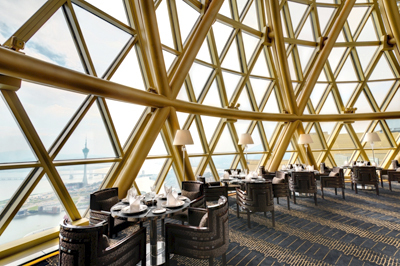 SIROCCO - "Located on the 63rd floor of The Dome at lebua, Sirocco is the world's highest al fresco restaurant and one of Bangkok's most coveted dining choices." SRA BUA - at Siam Kempinski Hotel. Sister branch of Copenhagen's Michelin-starred Thai restaurant Kiin Kiin. TABLES - at Grand Hyatt hotel. "Designed by the world renowned designer, Tony Chi, Tables evokes the nostalgia of Traditional European Cuisine, mainly French inspired, that takes you back to a “Once Upon A Time” experience. The Art of Tableside Cooking on intricately designed cooking tables creates a sense of showmanship and entertainment, offering a surprise element that complements your dining experience." 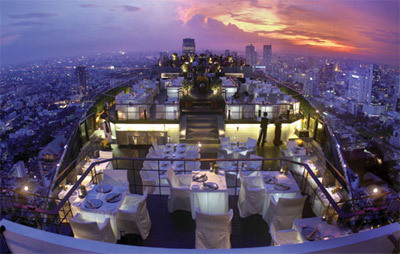 VERTIGO & MOON BAR - located on the 61st floor of the Banyan Tree Hotel. Walking Street Night Market NW. Specialty: food stall stir-fry. Le Jaroen Restaurant R&C. At The Scent Hotel. THE RESTAURANT AT THE PALACE HOTEL - award winning Rabelais restaurant. CAFÉ BAZAR NW. Specialty: barbecued pork. PHO 24 - serves Vietnam's best Pho noodle dish.